Last year I made a plan to start buying and reviewing US made products off Amazon. I was going to post the reviews to my personal blog and “practice what I preach” as a US manufacturing advocate. To get started I was able to find some camouflage cloth tape for a Halloween project somewhat by chance. I was then starting to look for other practical things and I really struggled to fill the pipeline with US made products that fit my needs. It was a really sad realization, Amazon wasn’t making it easy to determine where the products I was researching were made. In fact, it’s really hard. It wasn’t until recently when I listed something for sale on Amazon that I realized why. You don’t have to state a country of origin for your listings on Amazon. So if you don’t care to state, the buyer won’t know. At this point I was thinking that most US made products would take advantage of this and proudly note the country of origin. Country of origin not usually included. And in disgust, I put the card back on the top of the Tuesday pile, the day I usually work on web content. I guess sleeping on it made me a bit cantankerous, I decided to write about it anyway for this Wednesdays update here on MFA. 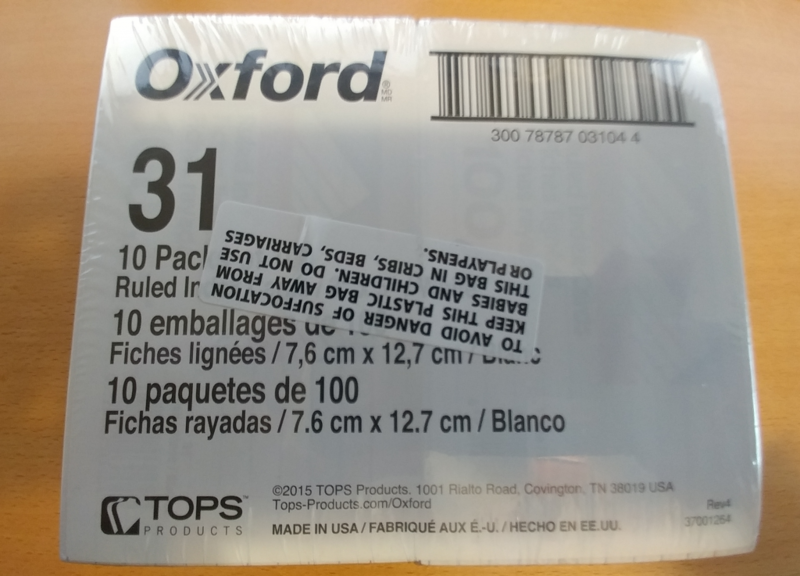 Amusingly, while preparing this update I discovered that the card I had written on, a white Oxford 3×5″ ruled card was actually made in Covington, TN by TOPS Products. That momentarily gave me hope, except when I went and visited the product page. I discovered that they didn’t list the country of origin or made in the USA or anything of the sort. That could be because they aren’t always made here, or TOPS Products didn’t think it would benefit them to list it. At this point it occurred to me that perhaps I was looking at this issue the wrong way. Maybe what should be done is an effort to encourage people to more proudly share when a product is made in the USA. We give you a little bit of this here on the Manufacturing Advocates Podcast (especially in Episodes 1, 2 and 9). US Manufacturers tell us where your products are made. Who made it? Which engineer came up with the design? Who tested it? How did they test it? Show me a picture, a video, and tell me their story. Who could resist that? I bet not even Jeff Bezos. Maybe then Amazon would start to understand the real value of helping enable people to be able to choose where the products they buy are made. I hope you enjoyed the variation today, next week should be more business as usual introducing our next guest. Let me know if you enjoyed this article, or if you thought it was terrible and irrelevant! There is something extraordinary going on in the San Joaquin Valley. Economic development, education and business interests have gotten together to form the San Joaquin Valley Manufacturing Alliance. Their upcoming manufacturing summit has already been making waves here in California, and I wouldn’t be surprised if they are felt farther and farther out as great ideas tend to spread. 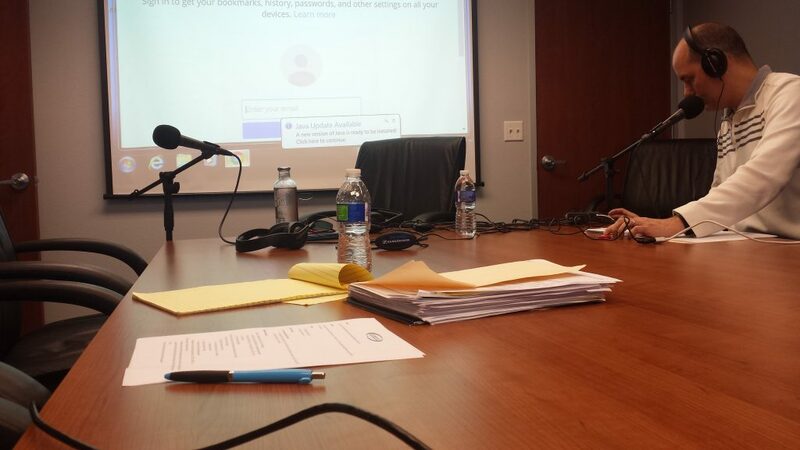 In Episode 9 of the Manufacturing Advocates Podcast I go in depth with two impressive gentlemen Mike Dozier and Mike Betts discussing the SJVMA and the Manufacturing Summit. I was really impressed with the work these two and their organization have done to help the community in a number of different ways. Listen in and hear for yourself. 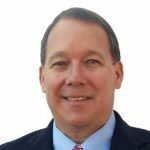 Mike Betts is currently Chairperson and Champion for SJVMA, He is also CEO of Betts Company. Mike has been incredibly generous with his time to help his community in many ways. This interview was truly the tip of the iceberg. Mike wants to be remembered as someone that always focused on improving the way things moved at Betts and in the community, putting his people and community first. To further build on the successful Betts Company legacy and leave it better. Today his son Bill and the team at Betts are as energized and excited about what the future will bring as at any time in their nearly 150 year history. Mike Dozier is currently the Vice Chair, Government & Public Policy for SJVA. He is also the Executive Director, Fresno State Office of Community and Economic Development. Mike has a distinguished career in economic development and knows a thing or two about leadership, in fact while I was setting up my gear he was discussing Abraham Lincoln. Mike hopes that his legacy is that he made a positive impact on the world and had fund doing it. Also that he “made his kids proud”. I believe another episode of Manufacturing Advocates Podcast is a possibility with these two. I wish I had left the recorder running in my conversation with Mike Betts. After Mike D. had to run off to an appointment Mike Betts hosted me for additional discussion and lunch at Betts HQ. It was a truly memorable experience. What do you say Mike and Mike? Want to interface with Mike, Mike and other past guests? Join the other US Manufacturing Advocates on LinkedIn or just get new episodes delivered to your inbox or via iTunes. As some of you already know, I moved from the Bay Area to El Dorado Hills in 2014. 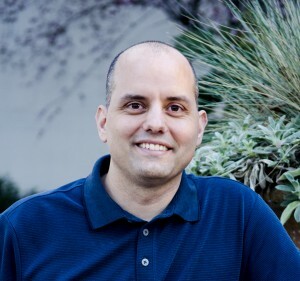 As a relative newbie to the greater Sacramento area I connected with the Sacramento Valley SME to get involved with other folks interested in precision manufacturing. That connection ultimately led to the creation of this podcast with a little inspiration from Bill Gaines. 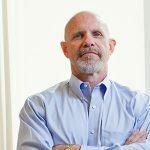 Then recently when Jeff Briggs (the current fearless leader of the Sacramento Valley SME) told me about a manufacturing summit in Fresno, I could tell he thought it was a big deal. While Jeff is at times easily excited when it comes to manufacturing, I took heed anyway because he has never steered me wrong. Jeff eventually got tired of waiting for me to take the hint and introduced me to Mike Dozier from CSU Fresno, suggesting we get together and talk about the summit on MFA. I won’t bore you with the back and forth and inter workings of arranging an episode of Manufacturing Advocates. I will say though that during those discussions Mike Dozier suggested we bring another voice in, a gentlemen named Mike Betts. He also broadened the scope of the conversation to include the San Joaquin Valley Manufacturing Alliance, the organization that hosts the manufacturing summit. Last week I road tripped down highway 99 to Betts Company to record episode 9. Next week you’re going to hear how Mike (Betts), Mike “D.” (Dozier) and the SJVMA have made a difference in the San Joaquin Valley. You’ll hear from two individuals with different ranges of experience in the private and public sectors. Hear how they and their collaborators at SJVMA helped propel an effort that is making huge waves in terms of economic benefit, addressing of skills gap, and much more. At 55 minutes it will be the longest MFA episode yet, but I couldn’t see eliminating a single minute of the interview. In fact I was really impressed before and after the microphones where turned on and off. What I learned about SJVMA, Betts Company, CSU Fresno and the CTE efforts going on in the area. There is enough there to do a whole series of episodes. I hope you will make time to listen to all 55 minutes of episode 9 next week, in the meantime you can head over to iTunes, Awesound or just browse the episodes here to get caught up. Not subscribed yet? Leave the “Sign me up…” checked and don’t forget to say hi on our contact form. Many years ago I was sitting in a restaurant in the silicone valley with a contract manufacturer (my client) and their customer. It was a social event, I had been lucky enough to be invited along to join them. As I sat and listened, I noticed that one of the managers from the customer was warning my client, that manufacturing was headed off shore and to plan accordingly. I was very concerned as this customer represented most of my clients business. I immediately thought how catastrophic losing this customer would be to my client, their employees and their families. Luckily, while being right overall, in the case of this customer the jobs stayed here. They were way too dependent on immediacy of their supply chain and containers full of parts crossing the ocean didn’t align well with that demand. Fast forward to several years ago when my manufacturing advocacy beginning to take shape, I was doing a lot of exploration and research. One of the names that kept popping up was the Reshoring Initiative. They seemed to be tapped in to all the latest content related to bringing manufacturing back from overseas. They curated it so well, that they became my main source of news related to reshoring of manufacturing and a whole lot more. When I did get around to starting the Manufacturing Advocates Podcast, they were already on my list of perspective guests. I know though, that you start with people you know. Why is that? They will believe in your success without a track record. So I left the Reshoring Initiative on the back burner while I got to work churning out the initial 7 episodes. 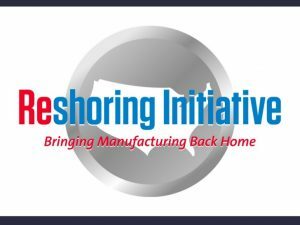 With a track record in place, I reached out to them via their LinkedIn group, and very quickly I was in touch with none other than Harry C. Moser, Founder and President of the Reshoring Initiative. Another member of the group sent me a message almost immediately after Harry, telling me how I will “get a kick out of Harry”. That would end up to be accurate and a lot more. 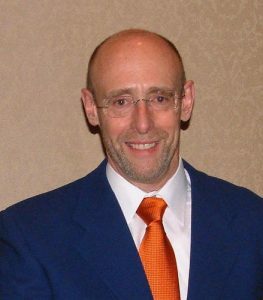 When I interviewed Harry, we started talking “off the air” and there was already a lot of levity as well as passion about the topic of reshoring jobs, his career in the industry and more. Harry was a natural communicator and fun to converse with, I knew it would be a fun interview to give and full of lots of great information. Needless to say, Harry delivered everything I expected and more. Sadly you’re going to have to wait until next week to hear what he had to say, but great things are worth the wait, right? Don’t worry though, in the meantime hop over to our LinkedIn group so you can be part of the conversation with Harry next week when episode 8 of the Manufacturing Advocates Podcast goes live. If you prefer you can also get new episodes delivered to your inbox or via iTunes. This episode is now live!